Brent Avalanche Model 2096 with 2,000-Bushel Capacity - Unverferth Mfg. Unverferth Manufacturing Co., Inc. announces the introduction of the Brent® Avalanche® model 2096 to its grain cart lineup. In addition to industry-leading unloading speed, convenience and durability, the model 2096 tops the load-carrying chart at 2,000 bushels. Today’s high-acreage crop farmers need grain carts with high-volume capacities and rapid unloading speeds for efficiently moving grain from the combine to the semi, unloading the grain and getting the cart back to the combine. 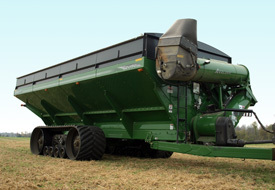 The model 2096 Avalanche grain cart does all that and more with unloading speed up to 1,000-bushels per minute and standard pistol-grip remote-control auger operation for filling each compartment of the semi with one-stop convenience, saving wear and tear on the operator and the tractor’s drivetrain. The model 2096 also features a standard Weatherguard tarp for protecting load contents from inclement weather. Electronic operation for the tarp is optional. Other options include hydraulic brakes for the steerable tandem provide enhanced towing control, side- and rear-mounted cameras connected to a 5.6-inch cab –mounted color monitor for full vision during unloading, backing, turning and transport and user-friendly scale packages with a large LCD screen for easy viewing, even in the brightest light. Unverferth Mfg. Co., Inc. is a family owned manufacturer and marketer of tillage, seed, liquid waste and grain handling equipment along with pull-type sprayers and agricultural dual, triples and specialty wheel products. For additional information contact Unverferth Manufacturing Co., Inc., P.O. Box 357, Kalida, OH 45853. Phone 1-800-322-6301, 419-532-3121 or visit the Web site at www.brentequip.com.